The Strela Cosmos CO42LAB is a reproduction watch made by the Strela company which operates in Munich, Germany, founded by Russian-born engineer Juri Levenberg. It assembles watches with Russian-made movements, and they offer the chance to buy a watch with an interesting hand-wound cam-controlled chronograph movement visible through the caseback, at an attractive price: €745. 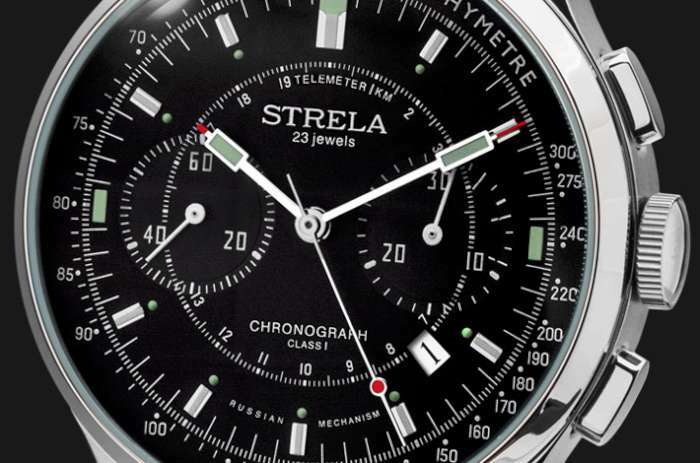 The name Strela was originally not a trademark, it means simply “Arrow” in Russian. 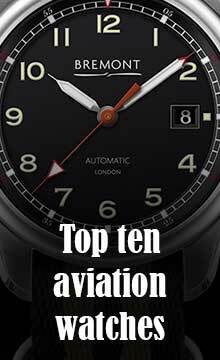 The original Strela watches made from 1959 were supplied exclusively to Russian aviators. 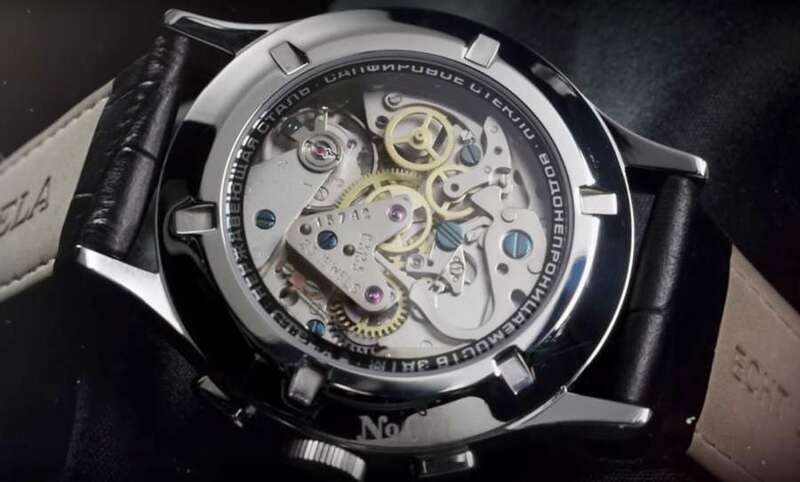 They were powered by the 3017, a 19-jewel column wheel chronograph, and they attained worldwide fame on 18 March 1965, when cosmonaut Alexi Leonov wore a 3017 Strela during the first ever spacewalk. The 3017 movement was based on the Swiss Venus 150/152 calibre, made by the First Moscow Watch Factory, later renamed Poljot. By the 1970s, Strela watches, made by Poljot and later Sekonda, became available to a wider circle of people in Russia. By 1979, about 100,000 units had been made. This reproduction by the new Strela company is 42 mm in diameter and 14 mm thick, with baguette-shaped pushers and a narrow crown, similar to the vintage Strela. The dial has the technical look typical of the vintage versions, with tachymeter scale, a complete seconds scale with fifth-second subdivisions, and a telemeter scale. The paddle hands are a distinctive feature of the Strela watch, with luminescent paint on the paddles and on dots inside the hour markers. There is a date window between 4 and 5 o’clock. The text “Class 1” on the dial is a reference to a differentiation between watches made for export in the 1960s, which were slightly higher in quality and so “Class 1,” and watches for the Soviet market. Today there is no such difference but the label has remained. 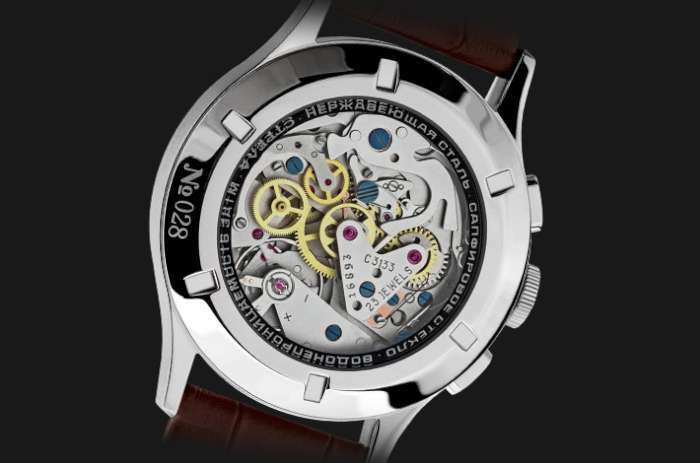 The 3133 MakTime movement has 23 jewels, and it is a cam-lever calibre based on the Venus 188, later made by Valjoux as the 7730, 7733 and 7734. Their descendant, the ETA 7750, is still in production, but this is a self-winding movement and isn’t as visually interesting as the hand-wound versions. MakTime purchased the calibre 3133 machinery from Poljot in late 2004 and continued production of the movement starting in June 2005. The movement runs at 3 Hertz (21,600 vibrations per hour), and it is hand-wound, power reserve 42 hours with chronograph off, 37 hours with chronograph running. Its precision is -10/+40 seconds max deviation per day. The chronograph functions are controlled by the two pushers in the usual way. The date can be quickset by repeatedly moving the minute hand from 11 to midnight and back again. The watch, reference CO42LAB, costs €745 inclusive of VAT, shipping costs excluded. 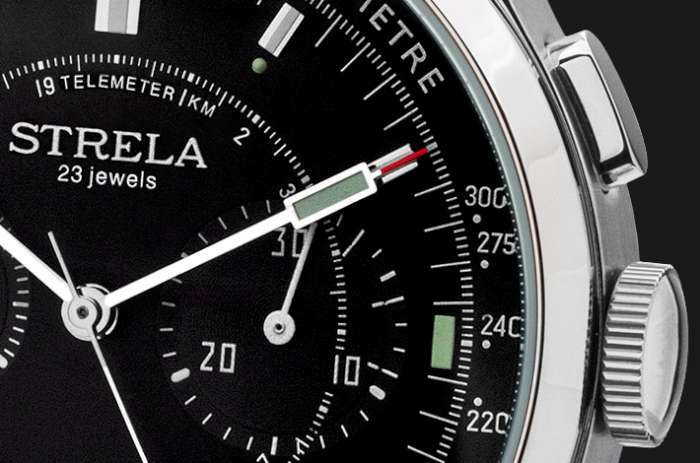 More information and online purchase at the Strela website. I bought this watch in March 2018 and while trying to set the date as instructed in the manual, the crown of the watch came off ! 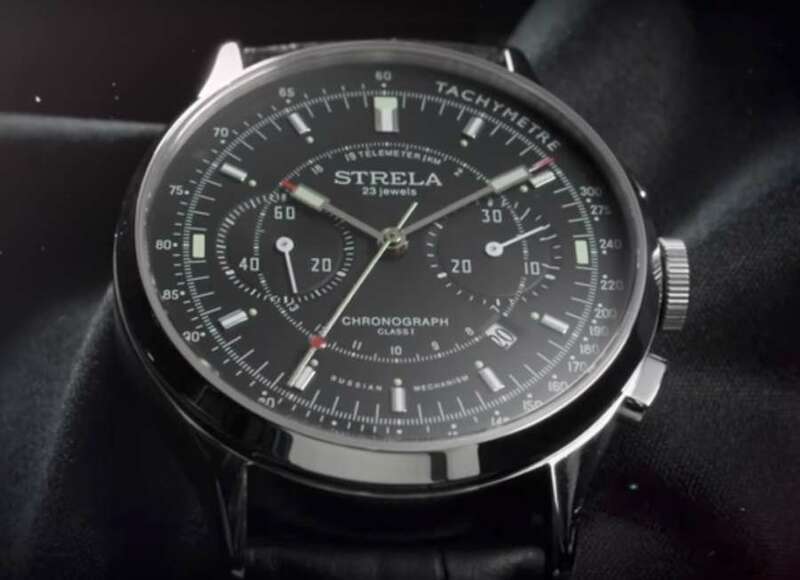 I was very disappointed and have tried contacting the company through phone and email listed on their website “https://strela-watch.de” but no one seem to respond, any idea how I can get in touch with the company?